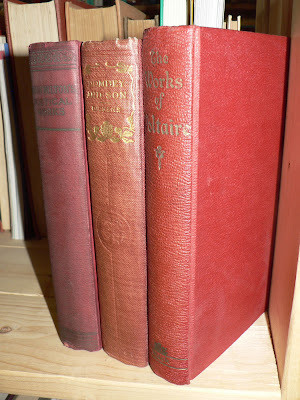 Includes Milton's Poetical Works, Works of Voltaire and Dickens' "Dombey and Sons." Comment to enter. I'll announce a winner tomorrow (April 7th) at 3:00 PM EST. but not a blue book! Interesting group of books. Throw my name in the hat! I love red!! I'd love those books! Rescue red books from becoming refuse. Pick me! I will thinking happy, positive, lucky thoughts. Heather, you should always think that way. They match my little red pen and my little red book, and my what a collection! Please put me in the mix! Thank you so much! Gorgeous books and after finishing Les Mis I have room on my TBR shelf. MUST FILL EMPTY SPACE! Anytime I can get my hands on a Dickens book I'm in! *my happy find of the week* a two-volume 1987 OED complete with box and magnifying glass for $5! I like the look of those books! What a great month to give away poetry :) Thanks! I'm feeling a bit blue today so a few red books would balance things out. Ooooo, Jaeyde, I am so jealous. Nice find! Yes, please! Oh very please. Please enter me too! Thanks for the giveaway! Let's see ... cerise, fire engine red, and vermillion. I would love to toss my name in the hat. Consider me entered, good sir! lovely, I'd like to see red, too! thank you! A little red does a body good! Oh...Works of Voltaire bound in my favorite color! I'd put them on a shelf, Dickens nestled and keeping warm between Voltaire and Milton. :) Pick me, please!